We have a few things com­ing up that the boys are look­ing for­ward to. We have a fam­i­ly trip, Thanks­giv­ing, vis­its from grand­par­ents, and Christ­mas among oth­er things. Every day, Asa asks me, “How many days untilx, y, or z?” As time pass­es, and as I answer his ques­tions every day, I real­ize how fast time is pass­ing. It seems like we were just at the park play­ing in the 80 degree sun­shine. All sum­mer, I spent time look­ing for­ward to two cousins’ wed­dings. Those things came, were great, and passed. Now, it’s near­ly Thanks­giv­ing and near­ly Christ­mas. Heck, it’s near­ly 2012! On a flight I took this fall, I talked with a woman who was sit­ting next to me. She told me that in her fam­i­ly, her rel­a­tives often live into their 90’s. She told me she had always assumed that at some point when peo­ple got old­er, their days slowed down and their time moved slow­er and slow­er. She was sur­prised to find out from her 80 and 90 year old rel­a­tives that they felt it was just the oppo­site. Their lives moved faster and faster, and sud­den­ly they were 90. Post­ing every day is hard! When I com­mit­ted to doing NaBloPo­Mo, I fig­ured it wouldn’t be too bad. I fig­ured I would write a lit­tle blurb each day, and voila, I’d know where my blog was going to go. Unfor­tu­nate­ly, that’s not hap­pen­ing for me yet. I know that I could post about my kids and my fam­i­ly every day. The dif­fi­cul­ty with that is that as Kael and Asa get old­er, I feel more pro­tec­tive of their pri­va­cy. Sto­ries that were cute lit­tle sto­ries when they were younger now have the pow­er to embar­rass them. I don’t want that. My pre­vi­ous blog was a (most­ly) breast­feed­ing blog. It was nice to know I had a gen­er­al top­ic around which I could orga­nize my ideas and posts. Also, if I was feel­ing a lit­tle low on ideas or per­son­al con­nec­tions, I could always con­nect my post to a cur­rent event or news sto­ry relat­ed to breast­feed­ing. I don’t feel like I have that right now. He is. He’s a great hus­band. He’s a won­der­ful dad. He’s patient. He’s a hard work­er. Man, do I love that guy. I thought about our mar­riage and the past 9 1/2 years togeth­er. I thought about our trips togeth­er, our moves, our kids. I real­ly couldn’t think of any rea­son I would do things any dif­fer­ent­ly. Jason and I sat down today to start think­ing about what we want to make for our Thanks­giv­ing din­ner. I’ve been telling my dad for a cou­ple weeks that we are hav­ing a tofurky (tofu turkey) as our main dish. I’m not sure he believes me which is fine, I sup­pose. We’re not hav­ing a tofurky. I fig­ured it is get­ting close to the time when we actu­al­ly have to start decid­ing what we are going to have though. So far, I think we have enough food for at least 15 peo­ple. There will be 4 adults and 3 kids at our meal. 🙂 When we were mak­ing our list of foods to have for our meal, Kael made it very clear that he would real­ly like some corn. It turns out he want­ed corn on the cob which is tough to come by this time of year, but he says frozen corn will be alright. Jason wants the tra­di­tion­al parts of the meal. He is in charge of the turkey and gravy. For some rea­son, I’m fix­at­ed on hav­ing sweet pota­toes, but I do not want the ones that have marsh­mal­lows on the top. We’ll also be hav­ing cran­ber­ry sauce and cran­ber­ry lemon­ade. Now, we just need to fig­ure out how to make sure every­thing gets cooked at the right tem­per­a­ture for the right time and is ready all at once. The oth­er day I wrote about want­i­ng to read more. Then, yes­ter­day I was think­ing about what I do on Pin­ter­est (beyond win­dow shop­ping for clothes and nail pol­ish­es for hours). I real­ized that Pin­ter­est would prob­a­bly be a great resource for knit­ting projects and pat­terns. So, I looked through some of the pat­terns for knit­ting and cro­chet­ing. After I looked for a while, I had a nice list of all the projects I want­ed to start. I real­ized that I had every­thing I need­ed. I have the nee­dles, the yarn, the pat­terns. All I need is more time. Unfor­tu­nate­ly, at this point, that may not be in the cards for a few more years. Oh, but it’s fun to look. 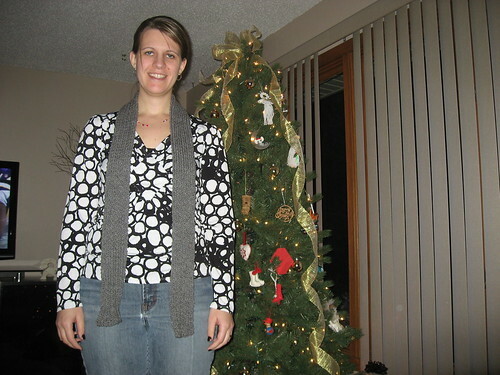 I knit­ted this scarf for my sis­ter-in-law for Christ­mas two years ago.